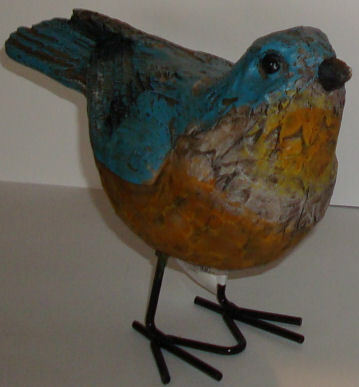 This little bird was at the dollar store. I don't know what I'll do with it yet; maybe a fairy will sit atop it, or some other kind of creature will be with it. He just called out to me. 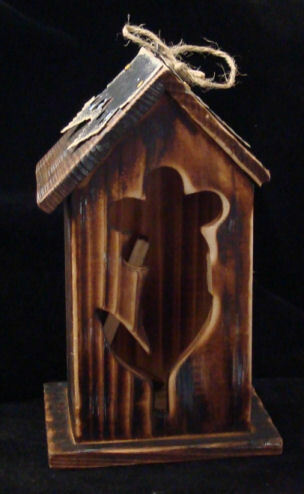 This terrific little birdhouse (its bird perch stuck inside) caught my eye. I think it could become a quarter scale setting by removing the front and adding a second floor, or - gasp - even a display for mini birdhouses! I have seen similar pictures like these stickers in some of the older homes in my area. I was thinking they could be used to simulate paintings on wood; maybe even wrapped around the appropriate piece of glass, even a piece of drinking straw, they could become religious candles. These ornaments are perfect for quarter scale! I removed the screw hangers. 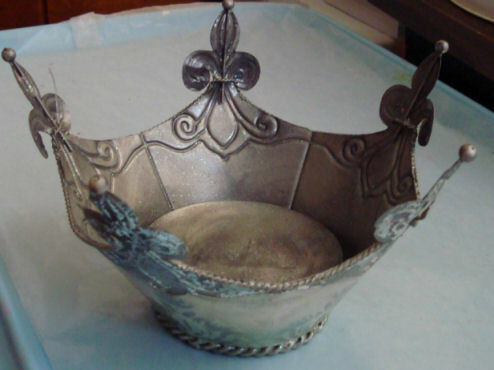 Look what these ornament caps can become - crown cake tins, for one, and the metal hangers can become clothes hangers with a bit of tweaking. 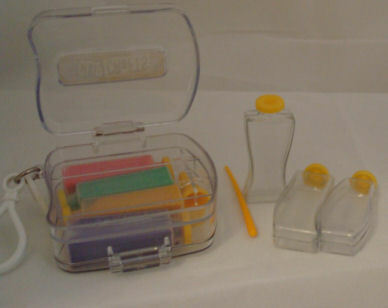 Even the plastic packaging can be a paint or beads palette, even cut into bowls or small bathroom sinks, or ....? 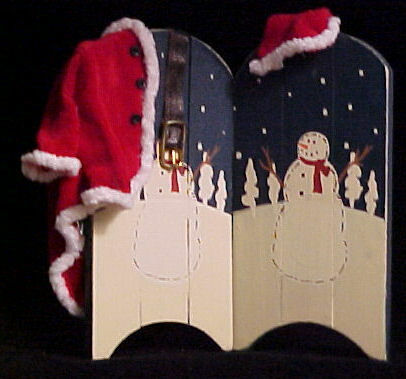 These sleds came in three different designs. Two of them made a splendid screeen for Santa. No doubt I can find uses for these new ones, too, especially when they were cheaper than even unpainted wood! 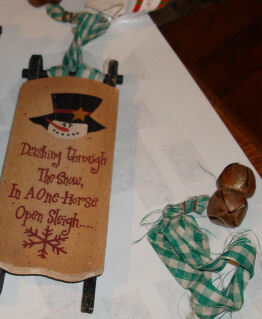 I figure those sled runners can be usefu for something, as well. Now this was an ultimate thrill; to find an ant and an alligator on the same day, at the Las Cruces NM Doll Show. 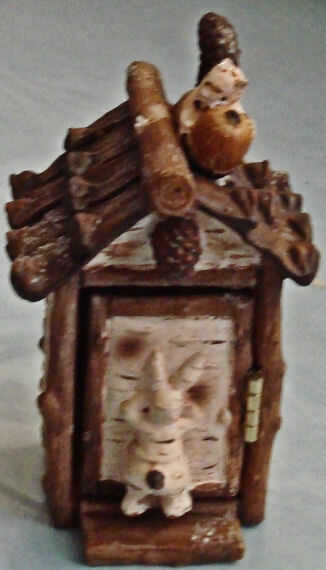 I have a story that's been written for some time about my visit to FairyLand for Mother Goose's Optera Court, and most of the setting is complete except for an ant, which I had planned to make. Who knew? 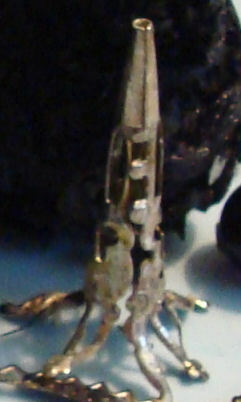 Just the reverse, the alligator is a companion for a completed doll that is waiting for a story. Right now I am just calling her the Swamp Woman, but one of these days I will know who she really is. In the meantime, the alligator can keep her company. 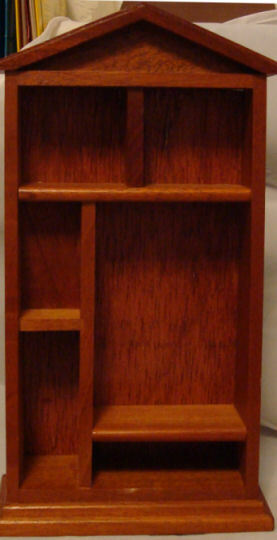 At the same show I found this little unit among full size doll furniture. It is very nicely finished and will be nice to display small scale pieces. I will need to add a plexiglass piece to the front to keep the dust out, of course. 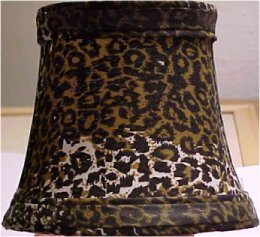 It measures 10 inches tall at the peak, and five inches at its widest part at the bottom. 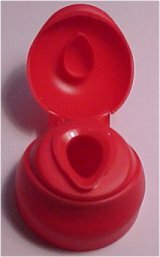 It has an interesting shape, deeper at the bottom. A very good buy at $3.00. My denal hygeinist is intrigued with the concept of the miniature settings I make. 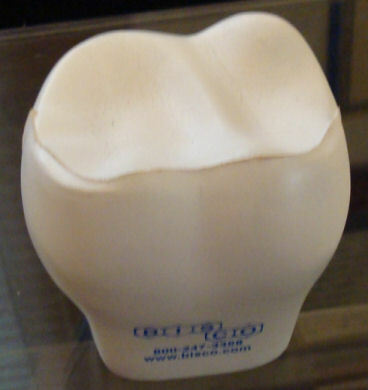 She gave me this (one of those things you squeeze when you need to make a vein pop up when a technician is drawing blood) so that I could use it to make a tooth fairy's dwelling! Since it is rubber, it will require some hollowing out if I want to put anything inside. On the other hand, I might just put windows and doors on it and landscape around it and call it good. Since I don't like to build roomboxes, I love finding finished pieces that I can use for my shops. This lightweight little box was at Hobby Lobby in their clearance aisle for 80% off. There is a crack in the lower corner on the right side, but I can easily replace that panel with some plexiglass. Several weeks later, I found two of these in the new arrivals. They aren't an exact match, of course, but the wood finish is close enough to make them blend together nicely. I only got them for 50% off, but figured my luck wouldn't hold to wait for the price to get any lower, since the supply wasn't plentiful. I may use all three of these for one shop, if I need to. Some of my collections turn out to need more room than I think when I start filling up a container. I can see all kinds of possibilities with this, as is; maybe cutting off one side to provide an opening so that fairies or elves could have a tea party. Also, the roof could be taken off and used on another structure, in which case the sides could be used as fencing. If nothing else, the individual sticks would make wonderful staffs for witches or wizards, supports for fairy cottages or cabins or SW roofs, etc. Not bad for $2.00. I purchased this hanging skeleton at Dollar Tree. 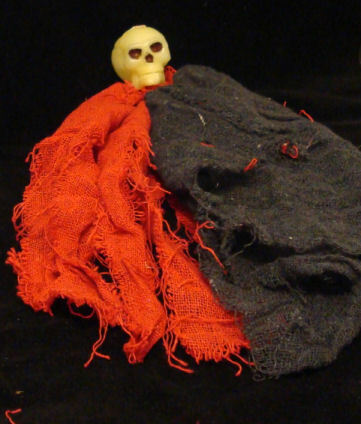 I wanted it for the red and black cheesecloth-type fabric but the skull will be useful, too, in a Halloween setting. 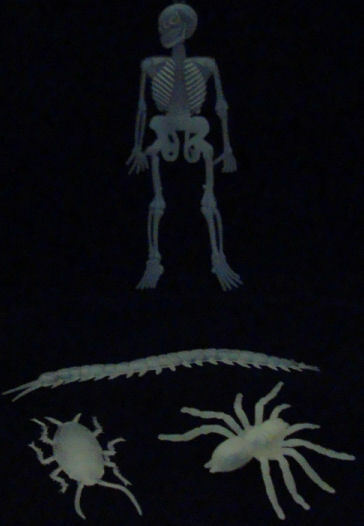 I found a good-sized bag of these glow-in-the-dark creatures in a variety of shapes and figures at a local dollar store. I can just see a shadowbox that glows when one turns off the light. This may be the place where I also finally use that glow-in-the-dark paint that I purchased so long ago, thinking I would use it sometime. I love it when Sometime finally rolls around. Oh my gosh, look who's happily showering inside. Next time, Santa, don't forget to secure the latch. I thought it was so cute that I bought two of them, in case I messed up the first one when I removed the Santa. 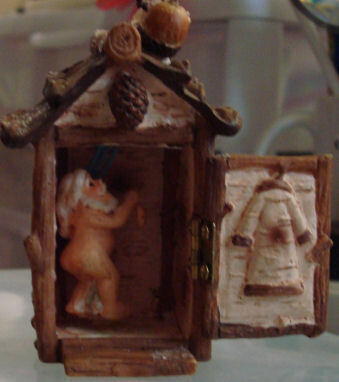 Now I have little naked Santas, PLUS two little outhouses/bathhouses. I found this "carved wood" Santa in a local gift shop. He was sitting on a big fake pine cone, which I carefully removed. I set him on this chest for the picture, although I am not sure yet how I will use him in future. He's actually so ugly he's cute. By the way, that neat little chest was a gift from my friend Lorraine of Florida, who stops by with Alice Zinn each year after the Vegas CIMTA Show. And I haven't a clue yet how I will use this little tin fellow, probably in parts, but it was so cheap at 90% off that I couldn't resist. I do think I will use the moon and star in another setting, however. 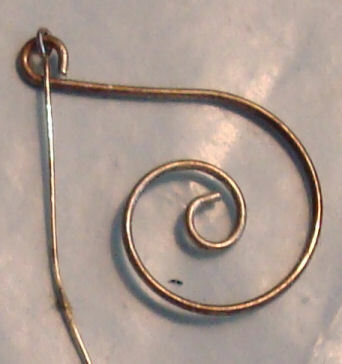 I also found this spiral ornament at the decorators warehouse. They had some very elaborate, truly gorgeous and unusual ornaments there, but they were all oversized and most would dwarf a tree in my real life house. I thought this one would make a neat fence or ladder or staircase in fantasy small scale, and maybe that's the Sorceror's Stone. 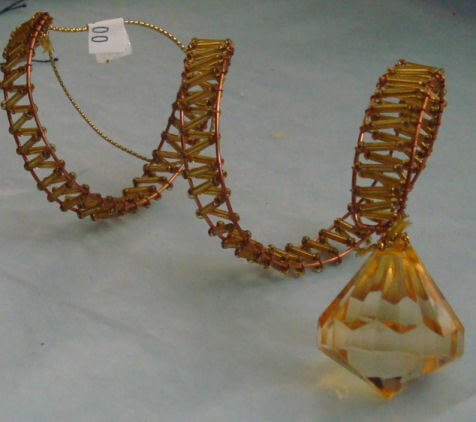 Or I guess if I needed a bazillion gold bugle beads, I could cut it apart. I think this was at Hobby Lobby in January or February;got it for probably 90% off. 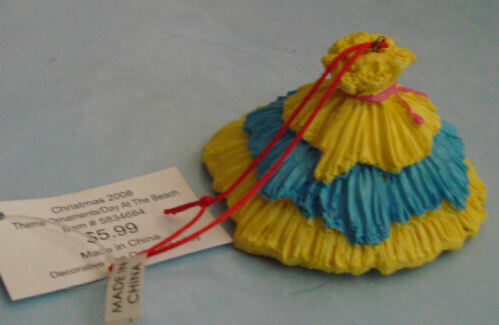 The tag says Day at The Beach, but I think most people would look at it and go, Wha..? But I could see it repainted and becoming the straw roof on some wee dwelling. Now you're talkin', I thought when I saw this one. Oh my, the goodies on this strange little beauty. So I dug out all the styrofoam that held it in such a firm round shape. And with a punching down of the top it becomes a perfectly acceptable witch's hat. Didn't have to do another thing! Why, even the hanger has possibilities! Now that tassel yielded a LOT of Cheap Thrills! 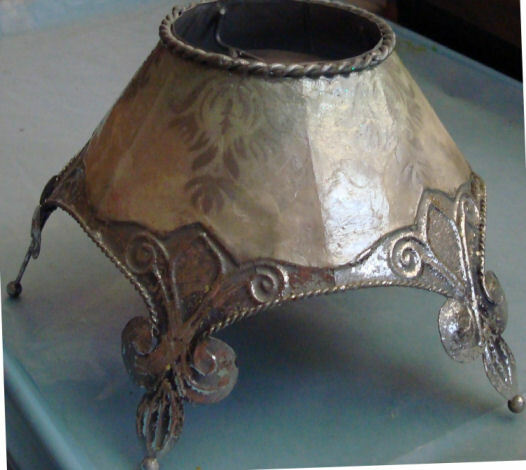 This Mexican tin Reyes' crown was probably intended to hold candy or cookies; maybe one of those giant candles. But I can see it as the top/roof of a medieval or sorceror's display. Wonder if it would fit over a large brandy snifter or even a fish bowl? Aw, who could resist having a ball point pen that looks like this? After I use up all the ink, I think he will find his way in some incarnation in my in-progress chicken shop. I found these in the clearance bin greatly reduced well after Christmas. 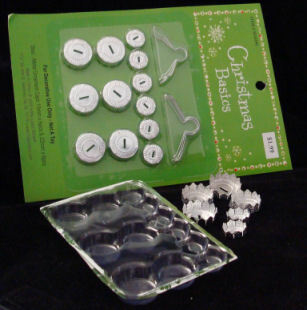 They serve to divide the clear plastic ornaments that one can fill with decorative items or scenes. 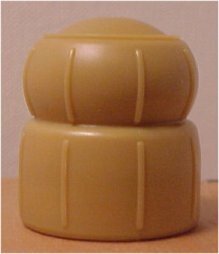 These make great bases for displaying a single special item under a small dome, or can serve as the base for a very small setting such as the Bucket Bunnies shown here. I found two of these very sturdy canvas garden bags on clearance at Tuesday Morning a couple of years ago, but have only recently gotten around to taking pictures. One, in blue canvas, had a matching hat, which I gave to my daughter because she IS a gardener. I don't have her green thumb, but use my bag for miniatures purposes. It has two capacious pockets on either end and four pockets front and back. Longer items can be tucked in the expanding pockets behind the white cord, which helps hold them in place. The straps are wide and easy on the shoulders, too. 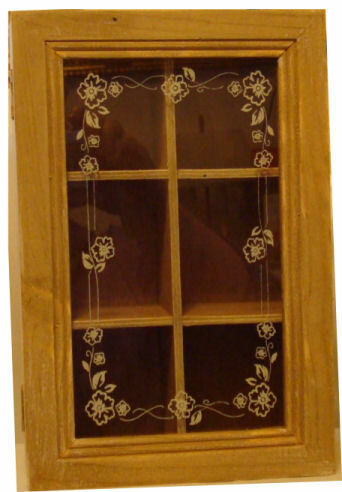 It opens wide and is perfect for carrying either a large glass dome or a regular sized roombox; even a small house. 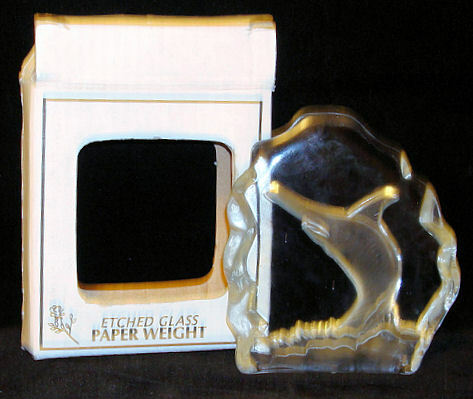 (A piece of foamcore could be inserted in the bottom for added support, if desired.) 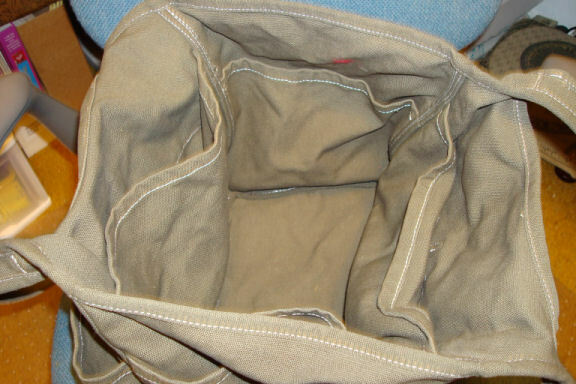 It has four interior pockets, as well. This bag is simply great to carry display pieces to shows or in-progress roomboxes to club meetings or workshops. 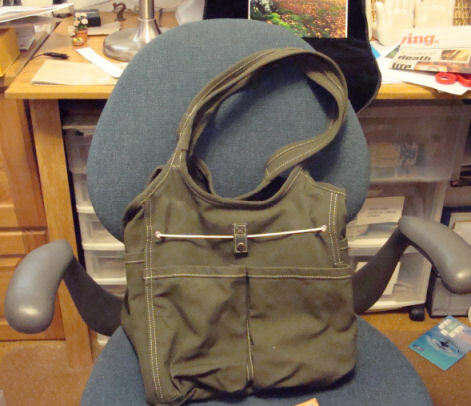 I was lucky enough to find mine greatly reduced at Tuesday Morning, but similar bags are available other places, including Duluth Trading Company. This copper garden hanging was also at the dollar store. When I looked at it, I thought, snails. It may be taken apart and its various elements eventually go into some future update of my visit to Gastro Podd's house. Of course, the various scroll pieces could be used for all sorts of things like table or bench supports, part of a garden wall or screen, etc. Maybe one section could be straightened somewhat and used as a wizard's staff. 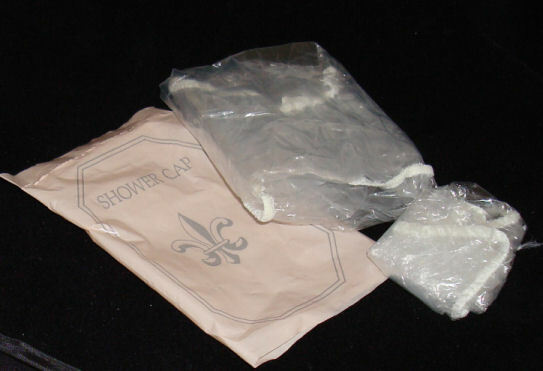 I cleaned out a drawer recently and found several shower caps from our travels. 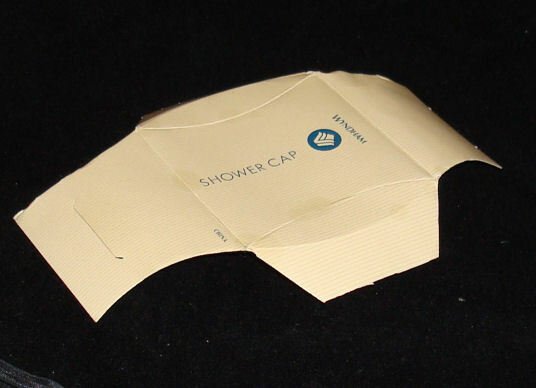 I have never been a shower cap person, but had tucked several in that drawer over the years "just in case." Well, it shouldn't be hard to get rid of these, I thought. And then it hit me: If this is big enough to fit over my head, what else might it cover? So, then I proceeded to see if the caps would work as dust protectors for settings that normally were covered by a glass dome at certain seasons. And I really like the way this packet folds. I am going to scan it and save the image for future use. Printed out on cardstock, when I need something to package a small mini for mailing inside a larger envelope this might be quite useful. 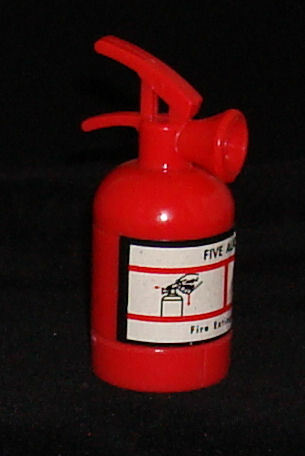 This perfect little fire extinguisher was one of a packet of six pencil sharpeners. With some black paint for the handle, perhaps some metal touches, it should be very useful. Hmm. with a little tweaking it might work as one of those gas can thingies that you see on the back of travel trailers, too. I found this little shadowbox at the Goodwill store. 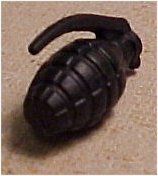 It measures 6 1/4 wide by 5 1/2 inches tall, perfect as a quarter scale display. It is only an inch deep, but should work for certain pieces. Maybe the whole thing could become an attic. I won't even have to do anything to it, if I don't want to wallpaper it; it's already nicely Shabby Chic. 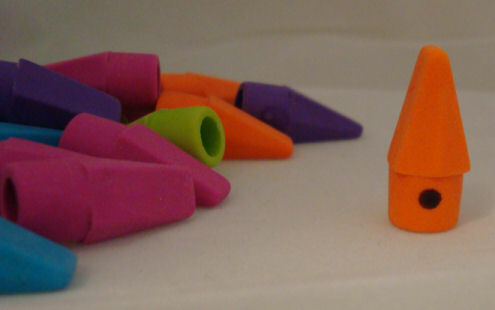 When I started putting one atop a pencil, I thought, That looks like a little house. With the dot of my felt marker, there is a birdhouse! A cut off sequin pin would make a good perch. Flip it over, and three empties! And look at those neat shapes, too; how they fit together in curves - perfect for a witch's or wizard's potions. What a deal! 2. Then stipple dark brown acrylic paint over the entire surface, shading to simulate the colour variation in real leather. 3. Over it all, put several coats of Mod-Podge, drying between each coat and again stippling and sponging off the excess with a crumpled paper towel. 4. 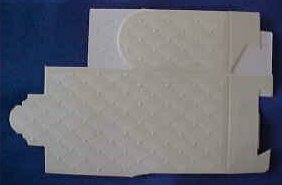 Once it's dried, the paper is flexible but resembles leather. Maureen Heuchert wrote me, "Finally have a cheap thrill that I can share with you. I don't have a "finished" picture of this as it is in the project of a friend but I do have a pic of the materials used." 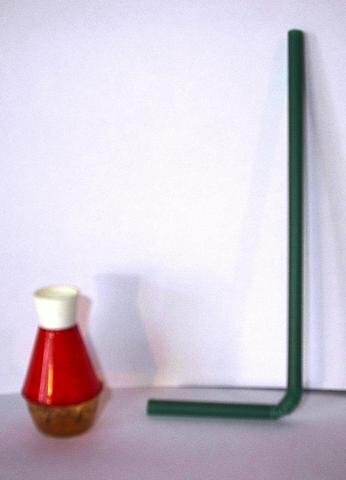 With just a food colouring container and a bendy straw, she had made a wonderful little heating stove for her mouse house. 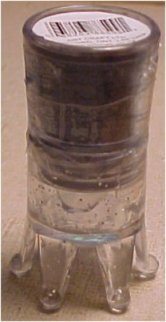 A door was cut in the upper portion of the container, the container painted black and the straw cut on the short side and attached to the "stove" for a stove pipe. She continued, "I knew I wouldn't be making any of the little stoves from the food colouring containers so was about to throw the last two out when I realized that the bottom clear part would make wonderful mixing/serving bowls and not only that, if I cut carefully, they would even have coloured rims - so dug the two I threw out yesterday out of the garbage and now I'll have a lovely set of four bowls. "BTW, even dried up food colouring has a lot of OOMPH left in it. Wear gloves if you’re going to do this. Don’t know how I’m going to explain my blue hands at coffee tomorrow. And the white caps make nice little flower pots! I particularly thought the little stove would intrigue you." Thanks, Maureen, for a great Cheap Thrill! "My daughter is well acquainted with Chaucer (she has an MA in English with a minor in classics and she is a published writer of fantasy) and was blown away by your Wife of Bath. 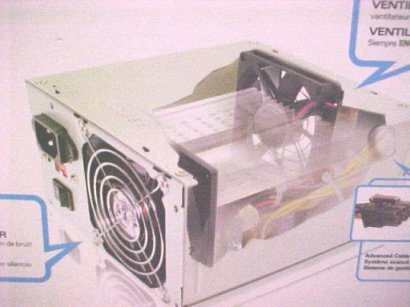 When my husband replaced the power source in my computer recently, he asked if I wanted to look at the old unit before he threw it away (another reason why I love this man so). Of course I did, and I wanted the wires, too, which he obligingly cut off for me, as well. There were all kinds of goodies in there, several of which will be good as miscellaneous industrial junk, when appropriately painted and weathered. But my biggest thrill was when I saw the ventilator fan. Aha! Just what I need to complete Cheap Jim's Good Junk store, a setting that is 90% done but still lacking something. Now that fan from some abandoned factory will draw the eye into a corner of industrial junk. I don't know yet where Cheap Jim got it, but there's a story there, no doubt. I know; I know; you're going Whaa-at? Yes, that's what they are called on the package, which I found at the dollar store. 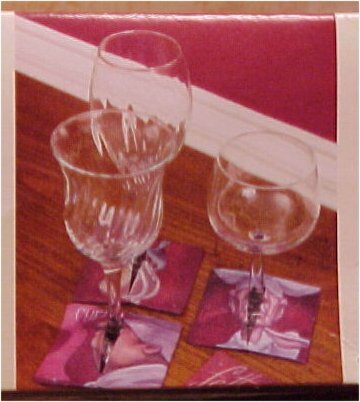 Apparently, if you are in the In-Crowd, you slip these over the wineglass bases because .... well, I suppose they're to differentiate mine from yours or something, or to work like a coaster, maybe. It opens up and it's lined nicely. Not sure what these will be used for, but they are intriguing. Perhaps curtain panels; upholstery? Maybe even as the top of a bedspread in a chicken- or farm-themed setting, using a piece of trim to cover the center section. 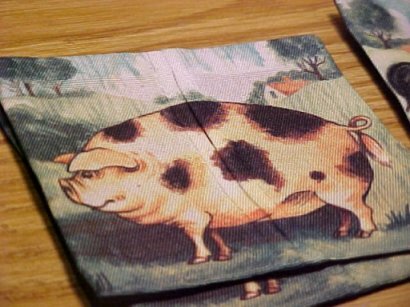 And what self-respecting miniaturist would not want pig panels? 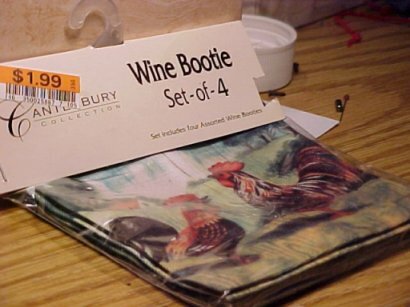 Or what self-respecting wine drinker wouldn't want to be identified by his pig bootie? 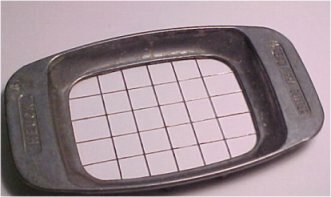 I was cleaning out the kitchen gadget drawer not long ago and came across this French Fry cutter. 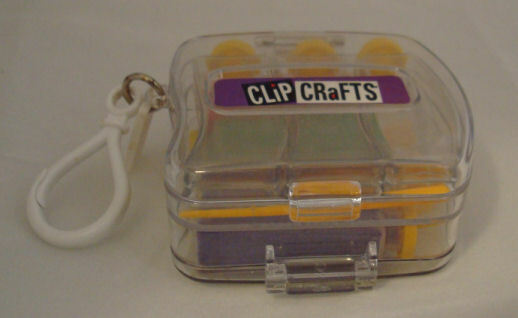 I hadn't used it for years and it was one more thing to clutter up the drawer. As I was about to toss it in the Goodwill donation bag, I noticed the even squares and thought, If this will cut through a potato, it will cut through a lump of clay! Since many clay sculpting recipes call for uniform sizes of clay, this might simplify the process. Well, as soon as I decided to transfer that gadget from the kitchen drawer to the clay drawer in the workroom, I came across this gadget. 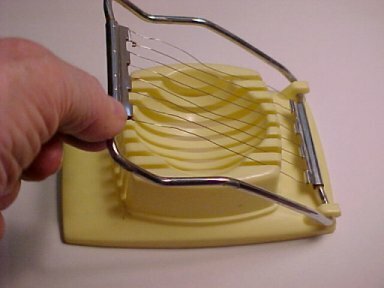 A boiled egg slicer! Now, wouldn't that work also with getting even slices through a lump of clay? On the other hand, some of those wires look a bit uneven. Still, ... I think I'll try it. This caught my eye at the dollar store. Not only do I have the sparkly grey eye shadow (which can be used for all kinds of mini purposes), but look at that crown! Most of all, however, look at that wash tub for a fairy! Can't you see it full of sparkly soapy water and bubbles and with bits of fairy clothing hanging on a nearby clothesline? I was running the vacuum in the grandchildren's playroom recently and noticed a little black object under foot. With a strip of chrome around the neck, now wouldn't that look just like a coffee carafe? I don't use creamer in my coffee any more, but keep some on hand in the refrigerator for those who do. 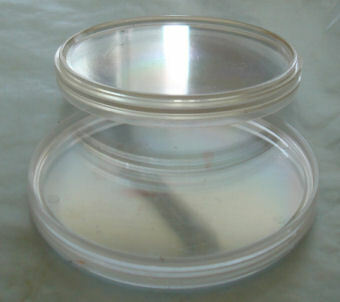 I was about to throw away the empty container recently when I focused more clearly on the lid. I found this half shade, which is designed to fit over a night light bulb, on a clearance table. Here it is, sans bead trim. 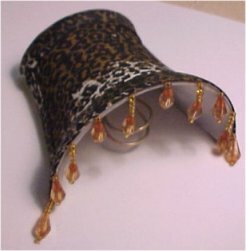 Won't this make a great canopy in a safari bedroom? 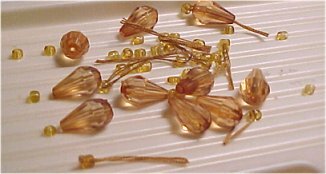 And what miniaturist can't use more beads? 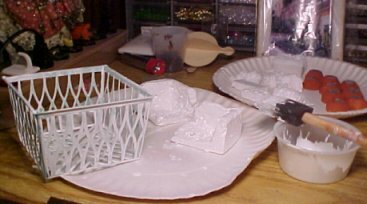 I had some gesso left from coating styrofoam packing material corners to make small adobe walls for miniature SW gardens. Rather than throw it out, I looked around to see if there was anything I could use it for, and there was a plastic berry basket. 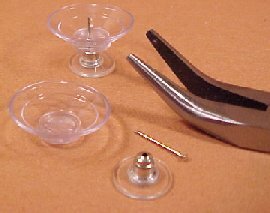 Every miniaturist probably knows about using these for window mullions or fencing for a balcony, etc. So, I gessoed it with my leftovers and now it is ready for finishing whenever I decide what I need that berry basket for. As my grandmother used to say, "Waste not, want not." 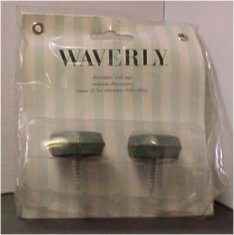 These shower curtain rings were among a jumble of washcloths and hand towels on a clearance table. 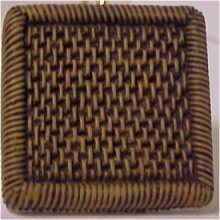 I was looking for another yellow towel to go with my changeover of colors in my bathroom and as I picked up the package to move them aside, I instantly saw wicker! Wouldn't these make great wicker seats for a garden setting? And with a base they could become tables, too. 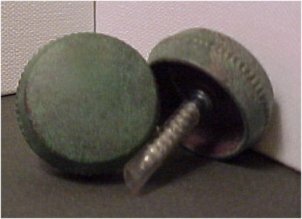 I paid a quarter for this package of vastly reduced screw-on end caps for curtain rods. Although these are heavy metal, the finish reminds me of a leather footstool with brass nailhead trim that we used to have. All I have to do is remove those screws, add some feet and set them in front of a chair or sofa. Here's one from Bombay Furniture that is much like what I am thinking. 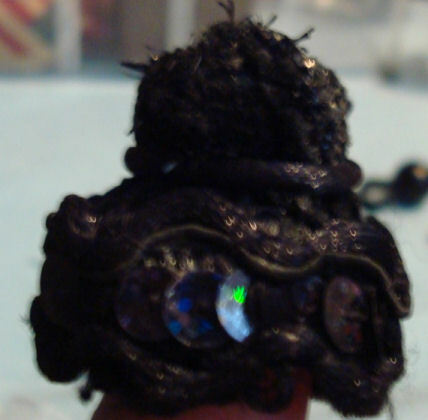 I just stuck one inside this black jet beaded napkin ring and it makes the kind of hassock seat you find in places like Bombay Furniture or World Bazaar. This lid came off a bottle of bubble blowing liquid that at first appeared to be champagne! 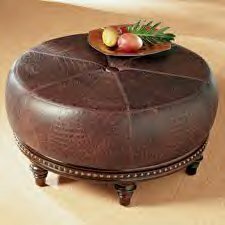 I saw it and immediately thought ottoman! This was a part of something else, but I have no idea what. It has a really pretty wood finish. Here is the back view. Notice the hole in the top? Probably a knob or finial screwed into it. 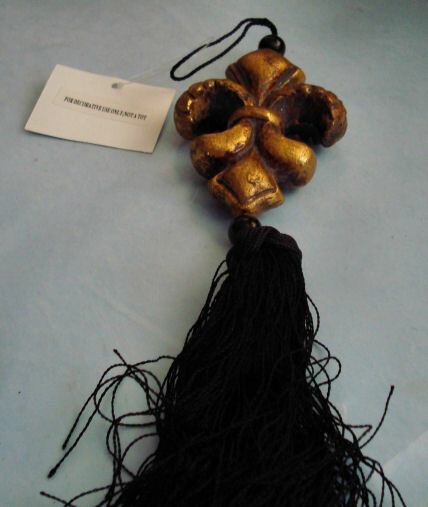 This looks Moorish to me. I could take this trim off and use it somewhere else, too. Looks like it's just nailed into place. It was only fifty cents, so how could I lose? 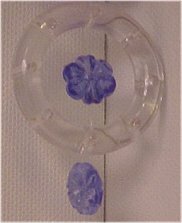 I found this little wind chime at the dollar store. 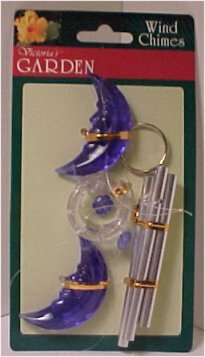 I wanted it for the moons, thinking I might use them in some fashion in my future setting, the East of the Sun West of the Moon Bakery. 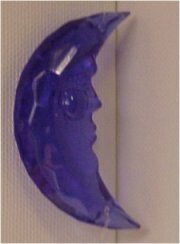 There are two moon faces. I am thinking about using them as supports for a glass shelf, perhaps. I'll bet those blue glass beads could be neat bases for a compote to sit on that shelf. 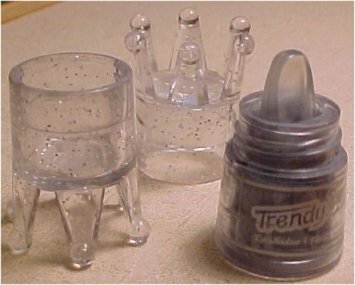 Could probably use one of them with one of these suction cups for a special dish; perhaps the other could be the lid on a matching glass jar. I guess I will add those thin metal tubes to the drawer with the brass tubes from my previous wind chime. Probably need them for something some day. If nothing else, they make good cutters for clay. And that blue bead might work as part of a lamp for the bakery. Not bad; all that for a dollar. 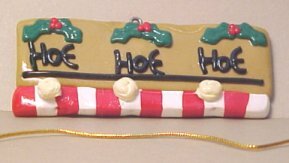 In mid-February I found this Christmas tree ornament (designed to hang from its white ribbon) in an almost- empty clearance bin at JoAnn's for 90% off. The white marble/ball had come almost completely unglued. 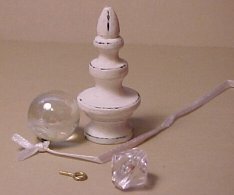 Taken apart, I have another gazing ball to use somewhere; as well as a base for a table, a birdbath, or a fountain; or a spire to go atop some structure. 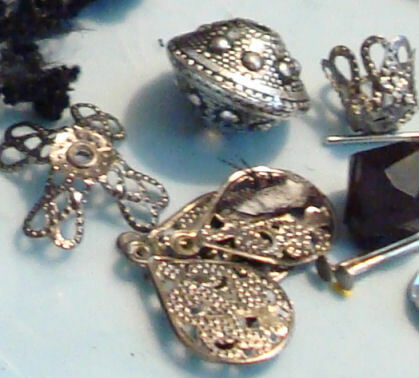 I also have a bit of small white satin ribbon that could trim a gift box; a glass bead that could become a perfume bottle, and another little screw eye. 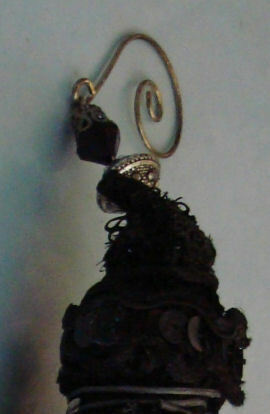 This hanging ornament probably had small garden tools hanging from screw eyes. If you look closely you can see the holes where the screw eyes were. As to what those little round blobs are supposed to represent, I have no earthly idea, unless the whole ornament was supposed to be decorated gingerbread. Hmm, now that I think about it, it does look like decorated gingerbread. 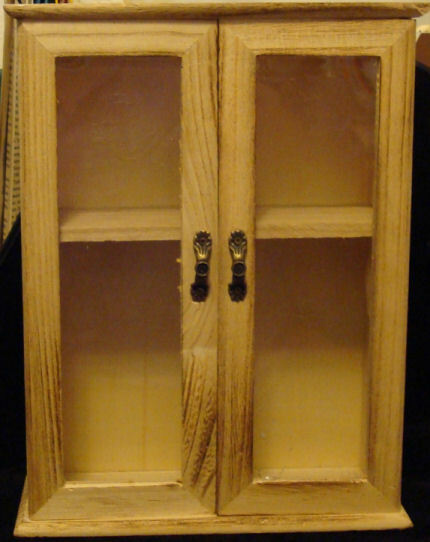 I was going to hang this in my garden shop, add new screw eyes and hang in-scale hoes and rakes, etc., but now I think I might try it on the outside of my mall gingerbread kiosk, with snow shovels hanging from it. 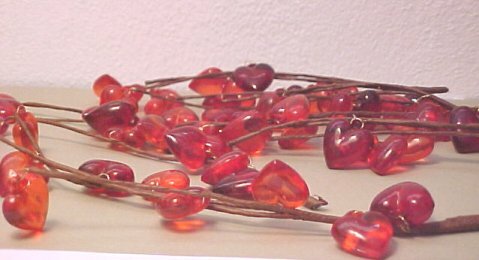 These red dangly glass-like hearts were on a garland about three feet long. They were vastly reduced, and I had enough to dress up a red wire wreath with red bow that I hang beside the front door in late January and leave up until after Valentines Day - and still have lots left over. I cut the rest of the stems off the main garland wire; enough to do heaven knows what with. 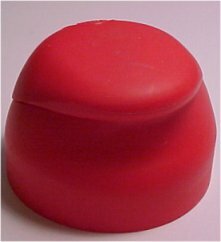 I figure I can come up with some uses in valentines scenes, of course, but am also wondering about using them as molded jello on a plate. Surrounded by whipped cream, they should look good enough to eat by some romantic couple. If nothing else, I will use them in full size decorating. 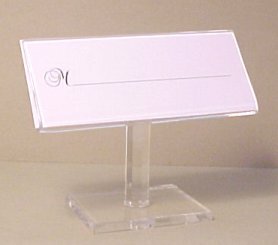 I bought three of these wedding placename holders, about three inches tall, at a greatly reduced price. 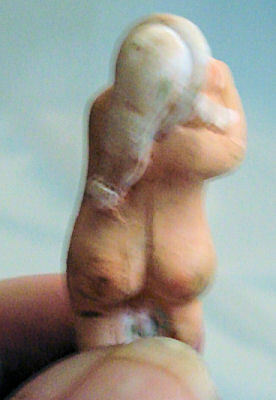 Some of my creations are so offbeat that a bit of explanation is sometimes necessary. Figured I could use these to sit beside an exhibit and help the viewer know more about the underlying story, or whatever. The label slips out, so I can replace it with whatever I choose to. 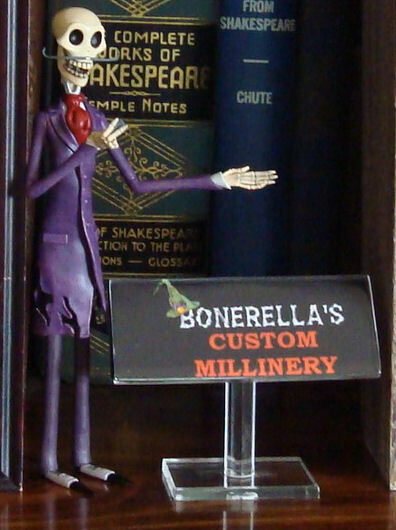 Here you can see one used for Bonerella's Millinery. These were in a clearance bin. 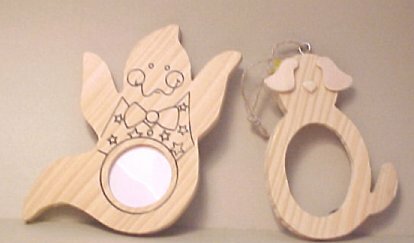 Not only could they be used as real picture frames of my favorite little ghosts and my dogs, but I could also see the dog one as the opening to a miniature doghouse. 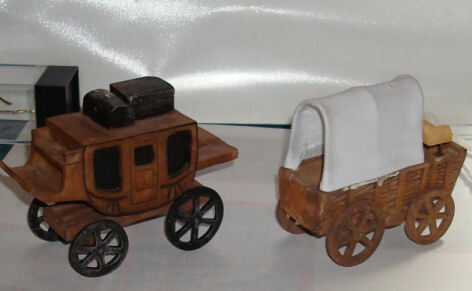 In quarter scale, they could have little boxes behind them and serve as themed shadowboxes. 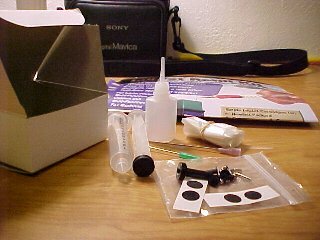 In one of my husband's thrifty phases, he tried buying ink refill kits on the internet to use in our Epson printer. He was not happy with the results, and said he was just going to throw the extra kit away. "Well, now wait a minute," I said. "Let me see what's in there." First of all, there is lots of ink here - cyan, magenta, yellow and black it says in the instruction booklet; and some extras that I haven't examined closely yet. Enough ink for many mini purposes, I would think. Here is what was in the white box! Wowser! Just look at those long tips! Can't you just see the possibilities? 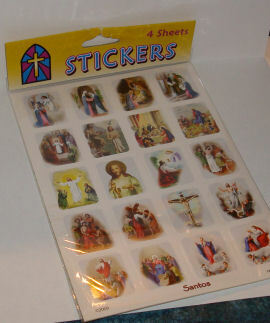 I may wind up using them for something other than the ink. Sometimes it is so hard to get glue into hard to reach places, for example. I don't think this could be called a Cheap Thrill, necessarily, if you bought it specifically for our miniature purposes, but since it was going to be thrown away, then it definitely fits that category in my household! 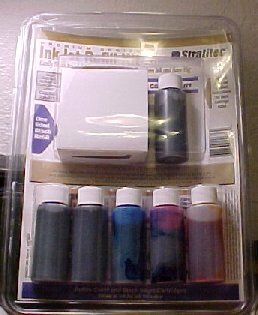 And speaking of ink cartridges, "Tanya" (teecrafty2000@yahoo.com) gave directions on the MiniatureCollectorsClub online list for a cash register made from a printer ink cartridge. So, the next time we replaced our ink cartridge I kept the old one (so typical, right? ), but ours for the Epson printer didn't look like a cash register to me, but suggested something else - like maybe one of those Starbucks machines where they make the lattes, etc.. Unfortunately, it has somehow gotten thown away and I will now have to wait to use up another one before I can take a photo. On the wedding aisle, I found a package of twelve folding boxes apparently intended to hold small gifts for attendants. They looked to me like the perfect base for making trunks. Here are the first two trunks I made. It's been a long time since I worked with these boxes, but as I recall they seemed a bit tall. I think I cut them down, but whether at the top or the bottom I don't remember. 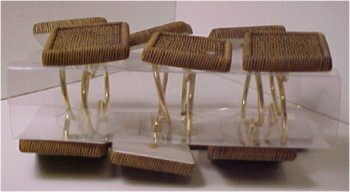 I also glued them to cardboard so that they would have a firmer backing, adding tabs to make it easier to glue the sides and bottom together. I used a straight edge and the back of the blade of a craft knife to score the folds, then cut them out with the ruler and a sharp new blade. 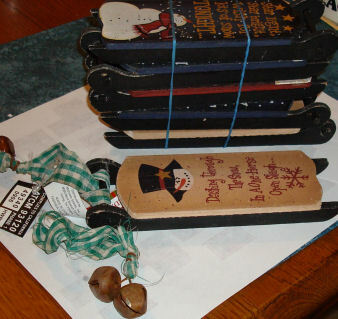 I cut through the original front flap, gluing the decorative part to the top edge of the trunk bottom, and used a second matching piece of decorative trim cut from an extra box, gluing it upside down above the trunk's lid opening. 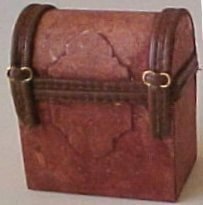 For this trunk, the box was painted terra cotta, then a slightly lighter clay color was sponged on to give it the appearance of leather. The straps and trim were narrow seams cut from an old leather purse, and the buckles on the straps are jump rings. I think I put a dirty water wash over all to blend. You can see this trunk jam-packed with items in the story of Anachronon the Wizard in the Fantasy pages. 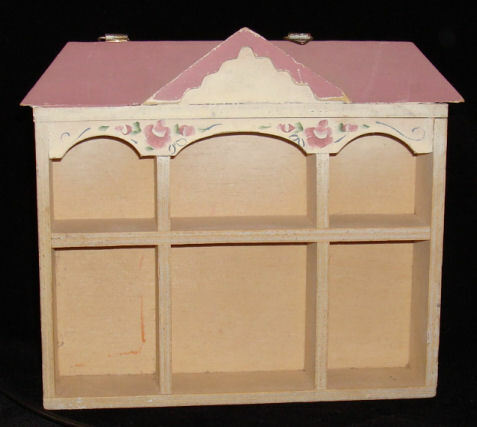 When I was a child, I had a little trunk for my dolls and doll clothes that had been decorated by my mother. For the second experiment with the wedding favor boxes I tried duplicating that little trunk. 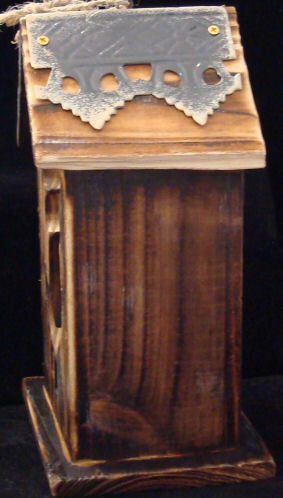 For this one, I merely glued the trunk together and painted it ivory. 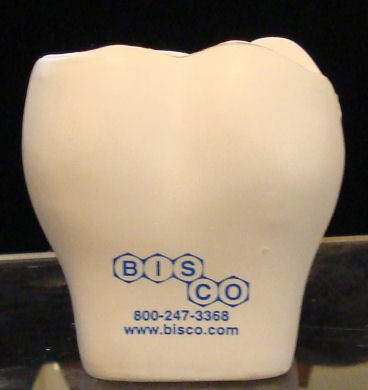 The decorative details were cut from a magazine advertisement for personalized business cards. 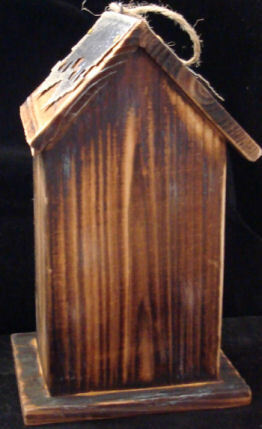 The design on the trunk top was outlined with a piece of gold gift tie cord. 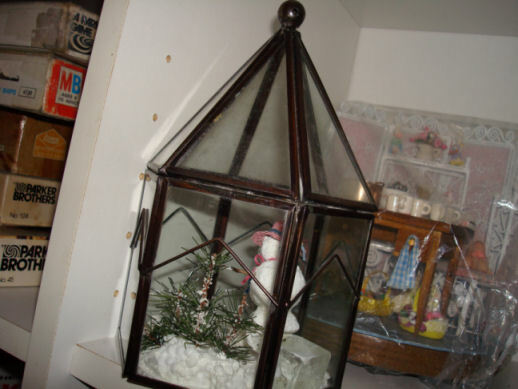 The "brass" trim was cut from a Christmas card, and the other piece of decorative trim was cut from a lace doily. Actually, it looked better "in person" than it does here; I should've done something to make the two brass pieces look more alike. I gave this trunk to a friend, so there is no opportunity to take better photos. I made more of these trunks in various designs and finishes, some with open lids, for a swap, but in those days didn't think of taking photos of all of them. 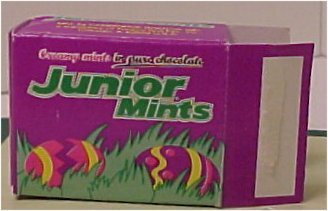 This little box that contained Easter mints is less than two inches long and a bit over a half inch deep. 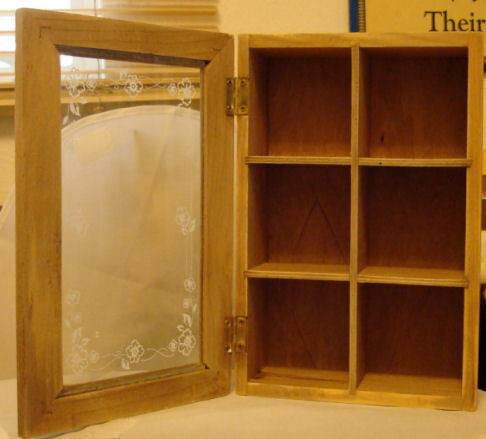 It will make a large old-fashioned suitcase or trunk, suitable to go in an attic or a 50's and earlier setting. 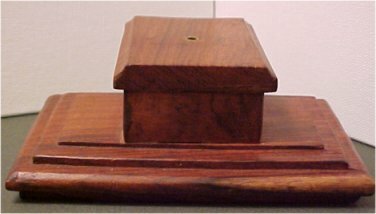 I have used individual serving raisin boxes to make trunks in the past but don't have pictures. 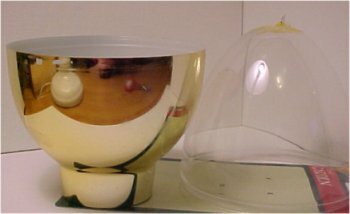 This egg-shaped container held Ferrero Rocher chocolates with hazel nuts. That blob on the top of the clear half was where a bow was stuck. Not sure what will get that off without messing up the plastic, so I may have to glue a bow or something else back on there to hide it. 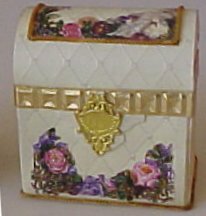 Obviously, this would be a great container for an Easter egg setting, but it could also hold a doll or special piece that needs emphasis and dust protection. 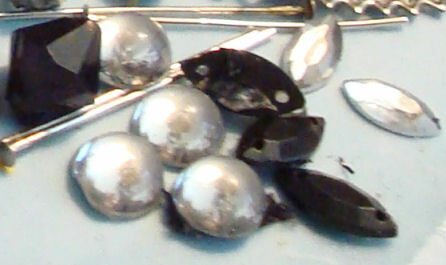 I have used clear plastic egg halves over the years as domes over small settings. This one would also work for that. I won this basic little party table in a club raffle one time. 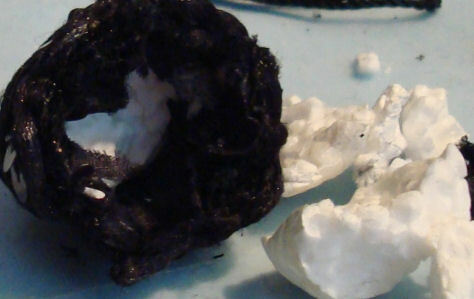 It's just a piece of styrofoam. The top was covered first, then the pre-pleated lace was glued in place. 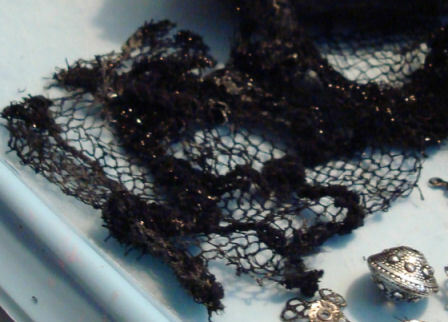 The fancy lace overlay covered the raw edges. 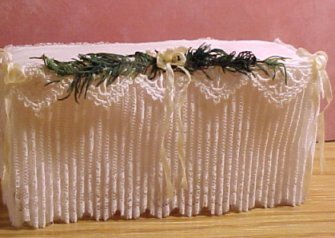 Silk bows are added as trim and a piece of cedar-like moss forms the swag. I have made many similar tables as gifts since then, but covered the styrofoam base with white fabric first so that if anyone lifted it up to look under (and you know people do that) it would look finished. These tables have appeared in many different settings over the years, including holding wedding cake and punch, or a bouquet, wrapped wedding gifts and a bride's book and fancy feather pen, for example. At different times I have added colorful tulips and pastel bows for an Easter brunch or poinsettias and Christmas baubles for a dessert table, etc. 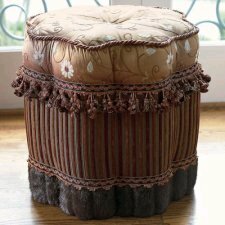 The pleated lace is usually widely available and this simple little table makes a great gift, too. 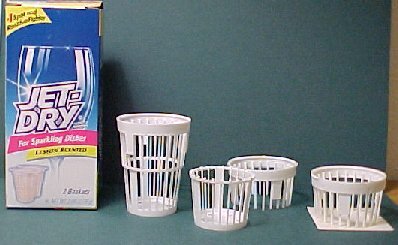 Our dishwasher does not have a built-in water softener dispenser, so we use Jet Dry in a basket which we hang over one of the wire racks. 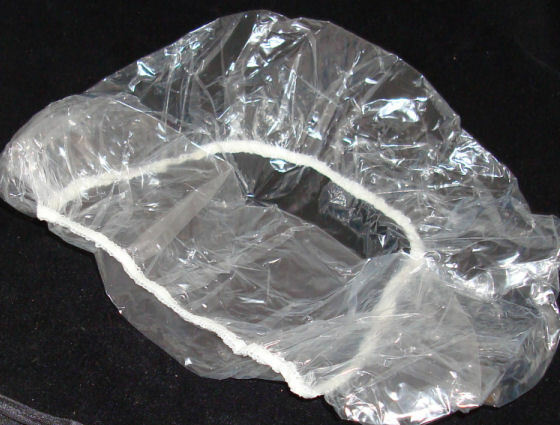 The tall basket is what an empty one looks like, after the plastic tie loop has been cut away. 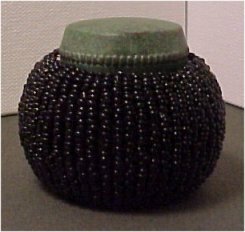 The two baskets in the middle show it cut along the center rim. The far right shows how to make a false bottom. Glue it in place and when dry, cut around the edges, then paint or finish as desired. You can see one of these used as a laundry basket in the Laundry page; another as an outdoor leaf basket in the Florida Flyer scene in Children's Projects. 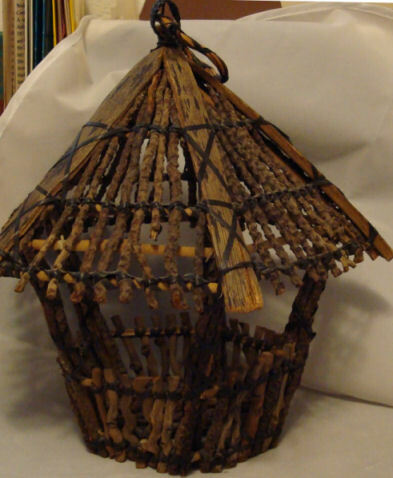 Recently Betty Brike of LA pointed out that these baskets could also be turned upside down and used as birdcages! Never had thought of that!